Continuous casting (CC) is a method of producing an infinite solid strand from liquid steel by continuously solidifying it as it moves through a CC machine. It is the predominant process route in a modern steel plant which links steelmaking and hot rolling. 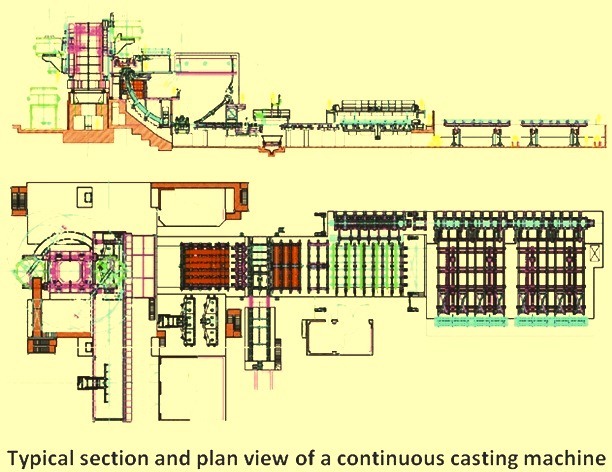 A typical section and plan view of a CC machine is shown in Fig 1. CC machines have evolved from the strictly vertical type of machine to curved machines in order to limit the installation height while still using high casting speeds. In recent years, CC machines of more sophisticated mechanical design are being constructed. These machines apply several techniques for achieving higher casting speeds and higher outputs and are with progressive straightening or progressive bending over a liquid core. The main types of the CC machines which are in operation these days are given below. In all cases, the bending and straightening is usually carried out in one or several steps. Multistep bending and straightening reduces the mechanical stresses and reduces the risk of strand cracking. The first CC machine which was built up for CC of liquid steel was a simple vertical CC machine. Then later the development led to many kinds of CC machines with various ways of bending and straightening. The main objective for these developments have been to construct lower and simpler CC machines with smaller need for space, lower investment costs, and high flexibility in production and maintenance. One of the main issues with a vertical CC machine is that the distance between the mould and the point of cutting is limited. Due to this the casting speed is low and low speed means low production rate. The advantage of the vertical CC machine is that there is no bending or straightening of the strand. In the case of large strand sizes, the stress caused by the ferrostatic pressure of the liquid steel inside the strand can lead to bulging of the solidified strand shell. The high bulging can lead to the formation of severe defects like segregations and cracking. It is therefore very important to support the strand sufficiently to avoid bulging. The higher is the machine, the bigger is the risk for bulging. This is also one reason for the development of the lower machines, i.e., bent or bow-type casters. One important characteristic in continuous casting is the removal of nonmetallic inclusions from the liquid steel. Owing to their lower density compared to the liquid steel, the inclusions are able to float up from the liquid. In the straight CC machines, the inclusions can float up more easily to the meniscus (liquid surface near the mould wall) than in the bow type CC machines. This is because in the bow type CC machines some inclusions can attach to the inner arc of the strand shell, when they are flowing up. This can be seen as a higher amount of inclusions but also as an uneven distribution of the inclusions in the as cast strand. So, the vertical or vertical bending type CC machines have the advantage that inclusions can float up better to the meniscus than in bow type CC machines. These days, the most common CC machine type is the bow type with curved mould. The strand leaves this curved mold in an arc without the need for bending after the mould and just with straightening at the lower part of the CC machine. In the case of larger strand, especially with slabs, also vertical bending CC machines are today more and more popular, because of the increasing need for cleanness. It is anyhow important to know that many things other than the CC machine design affect the cleanness and steel quality. The CC machines are normally named according to the strand dimensions such as billet, bloom, and slab CC machines etc. There are also CC machines to cast rounds and other shapes like beam blanks. Thin slab casting, inline strip casting and near net shape casting (dog bone) are some of the latest development in the field of CC machines. Horizontal CC machines have some advantages of low height and low construction costs over the conventional CC machines. These kinds of CC machines have been used for the continuous casting of many metals such as copper and copper alloys, but for steel, the technology is so complex that it is not widely used for the continuous casting of liquid steel. The choice between the types of casting machines depends on a complex optimization of the specific facility requirements for the CC machine productivity, product quality, machine complexity, and cost. With the introduction of the newer designs there has been an increasing adoption of the bow type CC machines with curved moulds for CC of slabs and to a lesser extent for CC of billets and blooms. Curved CC machines are normally simpler to build (lower cost) and maintain than vertical with bending machines, as the bender is eliminated. However, for some grades of steel, for example, plate grades, quality and casting speed limitations were previously more restrictive on these curved machines. Recently, with the technological developments of clean steel practices and electromagnetic stirring, curved CC machines have overcome these restrictions. In general, the complexity of the casting process and machine varies greatly between the types of product being cast (billet, bloom, or slab et.). This is due to the thermo mechanical characteristics of the cast sections, and to the different applications of the cast product. Billet sections are self?supporting in the secondary cooling zone, while slabs are usually not. Usually, billet CC machines have tended to be simple in design, with open pouring streams, limited automatic controls, and no roll support in the secondary cooling zone. On the other hand, slab CC machines are complex and use the total range of subsystems such as total stream shrouding, computer controls, and total roll containment throughout the CC machine. Bloom CC machines are intermediate between these two extremes. The main equipments of a CC machine constitute (i) ladle turret along with turret weighing system and ladle cover manipulator, (ii) tundish and tundish car along with tundish weighing system, tundish preheater and dryer, (iii) mould and mould oscillation along with mould level control and electromagnetic stirrer, (iv) secondary cooling consisting of strand cooling, strand containment and guiding, (v) withdrawal and straightener, (vi) dummy bar, dummy bar parking and dummy bar disconnect roll unit, (vii) pinch roll and torch cut off unit, (viii) Product identification system, and (ix) Roller table and product discharge system. Some of these equipments are described in more detail below. One very important part of a CC machine is the ladle turret. It is mounted at the reinforced concrete base. It holds the steel teeming ladles, which can weigh up to 300 t. By means of the ladle turret, the steel teeming ladles are alternately slewed into pouring and charging position. This function ensures the uninterrupted operation of the CC machine. While one ladle is being emptied, a full ladle is provided on the other side. The bearings in the ladle turret, in spite of being subjected to high forces and considerable tilting moments, reach service lives of more than 10 years. Ladle turret supports the ladles and its hydraulic system with rotary arms has the mechanism to allow the ladles to be raised and lowered whilst maintaining a horizontal position. Also strain gauge load cell is incorporated in the ladle turret to allow the weight of the ladles to be continuously monitored. Variable frequency AC motor is normally used for the transmission mechanism. Ladle turret usually has emergency response mechanism available for ensuring the safety of operators in an emergency. It also generally has manhole which ensures its easy maintenance. It is also normally equipped with the ladle cover manipulator. The main functions of the tundish are to be a steel reservoir between the steel teeming ladle and the mould, and in the case of multi strand CC machines to distribute the liquid steel into the different moulds. The first item is of special importance during the ladle change. In addition to being a reservoir of liquid steel, the tundish is more increasingly being used as a metallurgical reactor vessel aimed at improving control of steel cleanliness, temperature, and composition. Tundishes are usually of an elongated, geometrically simple shape. There are many types and shapes of tundish. One common tundish design for multi strand billet and bloom CC machines is a trough shape with a pouring box offset at the midpoint while for the slab CC machines the tundish is a short box or of a tub shape. The pouring stream from the ladle is directed downward to a position in the tundish bottom which is protected with a wear resistant pouring pad. This position is usually as far as possible from the tundish nozzle to minimize turbulence. In other locations, the tundish is lined with refractory bricks or boards. Weirs and dams are used as flow control devices which both increase the residence time as well as reduce the detrimental effects of turbulence on the liquid steel surface, the liquid steel streams entering the mould and dead zones. Nozzles for protecting the pouring stream against reoxidation between ladle and tundish and tundish and mould are used nowadays almost on all the CC machines, at least when casting high grade steels. Both stopper controlled nozzles and slide gates of various designs are used to control the steel flow from the ladle to the tundish and from the tundish to the mould. The free surface of the liquid steel in tundish is generally covered with slag to avoid reoxidation and heat losses from the liquid steel. The discharge rate of liquid steel is controlled by the bore of the nozzle and the ferrostatic pressure (height of liquid steel in the tundish) above the nozzle. Different bores are selected depending on the section size being cast and casting speed required. Stopper rod controlled nozzles are used for casting slabs and large sections when aluminum killed steels are produced. In this application, discharge rate of liquid steel through the nozzle is controlled manually or automatically by the setting of the stopper head in relation to the nozzle opening. Earlier oversized nozzles were used for casting aluminum killed steels because of the buildup of alumina so that the stopper head could be raised to compensate for a reduction in flow rate. Recent developments in deoxidation practices together with the use of argon bubbling through the stopper head and nozzle units have minimized the alumina buildup problem. Another development in controlling liquid steel flow from the tundish is the application of slide gate systems which are similar to those employed on ladles. These gate systems can also provide the capability for changing nozzles during casting as well as changing nozzle size. Tundish car usually adopts the half suspended design and is mounted at the main operating platform. It is usually hydraulic powered and is used to support and convey the tundish for casting or heating. It also incorporates weighing mechanism for the weight measurement to allow the weight of liquid steel to be continuously monitored. The mould is the heart of the CC machine and the origin of many defects can be related to the phenomena taking place in the mould. Hence the mould phenomena and control of them are of special importance. The main function of the mould is to establish a solid shell sufficient in strength to contain its liquid core upon entry into the secondary spray cooling zone. Key product elements are shape, shell thickness, uniform shell temperature distribution, defect free internal and surface quality with minimal porosity, and few non-metallic inclusions. The mould is an open ended box structure which contains an inner lining fabricated from a copper alloy which serves as the interface with the liquid steel being cast and provides the desired shape to the cast section. The liner is rigidly connected to an outer steel supporting structure. Moulds can be tubular moulds or plate moulds, and depending on the type of the CC machine, they can be straight or curved. For larger strand cross sections, as for slabs, plate moulds are normally used. The mould material has to meet many requirements. Mould materials usually consist of copper and some copper alloys. To avoid wearing of the copper material, the moulds are typically coated with chromium or other hard material. The mould is cooled by water and this cooling is called primary cooling. To avoid boiling or bubble formation in the water channels, which makes the cooling unstable, the water velocity in the channels is to be fast enough, even up to 10 m/sec or more and the water temperature must not exceed 50 deg C. It is also important that the water is clean and any deposit cannot be accepted on the cooled surface. The steel shrinks as it solidifies and cools. As a result, the moulds are normally tapered or multi tapered to compensate for the strand shrinkage as well as to ensure a good contact between the mould and the shell and so to ensure a good and smooth heat transfer from the shell to the mould. To prevent the high friction between the mould and the steel, the mould is oscillating and the casting powder (or oil in some cases) is used as a lubricant. Casting powder is very effective to keep mould friction low and strand surface quality high. Casting powder is added on the steel surface manually or using automatic powder feeders. It is important to have a stable pool of liquid casting powder on the top of the steel level to ensure the constant and smooth feeding of the liquid powder into the mould-steel interface. There are two types of mould design namely (i) tubular mould, and (ii) plate mould. Tubular moulds conventionally consist of a one piece copper lining that usually has relatively thin walls and is restricted to smaller billet and bloom casters. Plate moulds consist of a 4 piece copper lining attached to steel plates. In some plate mould designs, opposite pair of plates can be adjusted in position to provide different section sizes. For example, slab width can be changed by positioning the narrow face plates, and the slab thickness can be changed by altering the size of the narrow face plates. The plate mould is inherently more adaptable than the fixed configuration, tubular mould. In addition to permitting size changes, changes can also be made to the mould taper (to compensate for different shrinkage characteristics of different steel grades) as well as ease of fabrication and reconditioning. During the casting operation, the copper liner is subjected to distortion (a change in the internal dimensions of the mould). It is caused mainly by mould wear and mold deformation due to thermal and mechanical strains. Control of heat transfer in the mould is accomplished by a forced convection cooling water system, which is normally designed to accommodate the high heat transfer rates that result from the solidification process. In general, the cooling water enters at the mould bottom, passes vertically through a series of parallel water channels located between the outer mould wall and a steel containment jacket, and exits at the top of the mould. The primary control parameters are namely (i) the volume of water at the required water temperature, pressure and quality, and (ii) the flow velocity of water uniformly through the passages around the perimeter of the mould liner. Mould oscillation is necessary to minimize friction and sticking of the solidifying shell, and avoid shell tearing, and liquid steel breakouts, which can wreak havoc on equipment and machine downtime due to clean up and repairs. Friction between the shell and mould is reduced through the use of mould lubricants such as oils or powdered fluxes. Oscillation is achieved either hydraulically or via motor-driven cams or levers which support and reciprocate (or oscillate) the mould. Motor driven cams, which support and reciprocate the mould, are used primarily. Mould oscillating cycles are many and varied with respect to frequency, amplitude and pattern. Many oscillation systems are designed so that the cycle can be changed when different section sizes on steel grades are cast on the same CC machine. However, there is one feature that has been adopted, almost without exception, which applies a negative strip to the solidifying shell. Negative strip is obtained by designing the ‘down stroke’ of the cycle such that the mould moves faster than the withdrawal speed of the section being cast. Under these conditions, compressive stresses are developed in the solidifying shell which tends to seal surface fissures and porosity and thus enhance the strength of the shell. During the ‘up stroke’ portion of the cycle, the mould is very rapidly returned to the starting position and the cycle is then repeated. Thus the shape of the oscillating cycle is non?symmetrical with respect to time. Electromagnetic stirring (EMS) systems create the electromagnetic force, which works on every unit of volume of steel and bring about a stirring motion in the liquid steel. An EMS system consists of (i) power pack including transformer and high and low voltage power distributor, (ii) frequency converter,(iii) stirrer, (iv) monitor/controller, and (v) cooling water system. The application of electromagnetic stirring (EMS) technique promotes the formation of an equi-axed crystallic zone in the strand. It causes the refinement of the solidification structure, the reduction in the content of inclusions and improvement in the quality of the surface, sub surface and the inner structure of the cast product. Typically, the secondary cooling system is comprised of a series of zones, each responsible for a segment of controlled cooling of the solidifying strand as it progresses through the machine. The sprayed medium is either water or a combination of air and water. Three basic forms of heat transfer occur in this region are as follows. Radiation – It is the predominant form of heat transfer in the upper regions of the secondary cooling chamber. Conduction – As the product passes through the rolls, heat is transferred through the shell as conduction and also through the thickness of the rolls, as a result of the associated contact. This form of heat transfer follows the Fourier law. This form of heat transfer also occurs through the containment rolls. Convection – This heat transfer mechanism occurs by quickly-moving sprayed water droplets or mist from the spray nozzles, penetrating the steam layer next to the steel surface, which then evaporates. In CC machines the cast strand is required to be supported by rolls and guided from the vertical to the horizontal plane. The containment region is an integral part of the secondary cooling area. A series of retaining rolls contain the strand, extending across opposite strand faces. Edge roll containment may also be required. The focus of this area is to provide strand guidance and containment until the solidifying shell is self-supporting. In order to avoid compromises in steel product quality, careful consideration is to be made to minimize stresses associated with the roller arrangement and strand unbending. Thus, roll layout, including spacing and roll diameters are carefully selected to minimize between-roll bulging and liquid/solid interface strains. In order to restrict deflections, the rolls are supported in several rolling bearings. These bearings are subjected to high loads, low speeds, splash water, and high temperatures. The rolls are normally supported in spherical roller bearings and cylindrical roller bearings of various designs (open, sealed, unsplit or split). In the upper segments needle roller bearings are generally used. Strand support requires maintaining strand shape, as the strand itself is a solidifying shell containing a liquid core which possesses bulging ferrostatic forces from head pressure related to machine height. The area of greatest concern is high up in the machine. Here, the bulging force is relatively small, but the shell is thinner and at its weakest. To compensate for this inherent weakness and avoid shell rupturing and resulting liquid steel breakouts, the roll diameter is small with tight spacing. Just below the mould all four faces are typically supported, with only the broad faces supported at regions lower in the machine. Equally important to strand containment and guidance from the vertical to horizontal plane are the unbending and straightening forces. As unbending occurs, the solid shell outer radius is under tension, while the inner radius is under compression. The resulting strain is determined by the arc radius along with the mechanical properties of the steel grade being cast. If the strain along the outer radius is excessive, cracks can occur, seriously affecting the quality of the steel. These strains are typically minimized by incorporating a multi-point unbending process, in which the radii become progressively larger in order to gradually straighten the product into the horizontal plane. Dummy bars are usually of different types according to their design. These are (i) rigid dummy bars, (ii) dummy bars with rigid movable parts and expandable (pneumatic) sections, and (iii) dummy bars with movable parts (chain type). Rigid type dummy bars are easy to operate and are simple in design. They have operational reliability. Chain type dummy bars are used at any kind of CC machines. Depending on mobility of the sections, the dummy bar chains can have rigid or expandable sections. Dummy bars with rigid sections are equipped with hydraulic mechanisms of moving and hold-down of rolls. Dummy bars with expandable sections are used with spring type hold-down of rolls. Some CC operators prefer to use rigid dummy bars for multi strand CC machines of radial type, which allow speeding up the process of preparation of CC machine strand. The rigid dummy bar is a curved beam of a same cross-section which is to be cast in the CC machine. The beam is bended to match the curvature radius of the process axis of CC machine. The feeding of the rigid dummy bar into the mould is performed upwards through the machine roller guide. The rigid dummy bars are easy to manufacture and use. Design of the head of a dummy bar is based on the method of feeding, placement in the mould, installation of the sealing and cooling, as well as the method of hookup with and separation from the cast section. The device for removal and storage of dummy bars is designed for every particular strand. Delivery and feeding of dummy bars into the mould, their separation from the cast section and removal after pulling through roller guides, and holding in the non-operating position are performed by means of special machines, which are often equipped with special auxiliary mechanisms. Dummy bars can be fed into the mould in two ways, namely, downwards and upwards. Following straightening, the strand is conveyed on roller tables to a cut off machine where the section is cut to the desired length. There are two types of cut?off machines namely (i) oxy- fuel torches and mechanical shears. Oxy- fuel torches are employed for large sections such as slabs and blooms. Billets are either cut by torches or shears. After cutting to the desired length, the cast product passes through the product identification system where the product identification is either punched or painted. After this, depending on the shape or grade, the cast steel section is either be placed in intermediate storage, or hot charged in the reheating furnace for hot rolling or sold as a semi-finished product. In case of smaller sections the cast product is transferred to the cooling beds which are predominantly of the turn over walking beam type to maintain product straightness.